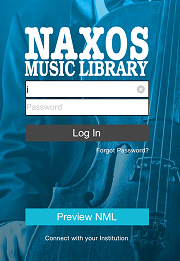 Q: How do I use the Naxos Music Library app from Johnson County Library? Go to Naxos Music Library from our eLibrary. Select Mobile App from the top menu of the Naxos website. Select Sign Up to create a Member Playlist account. Fill out the form and select Register New Account Now. Go to your email account and look for a message that allows you to activate your Naxos account. Then just download the app and login with your email address and password that you created! No need to follow the "Connect with your Institution" link if it appears at the bottom of the screen.